This site offers advice on how to make reading on screen easier. Search (right) for the device you are using, the type of file you are trying to read or the problem you experience when reading on screen, use the menu links at the top to browse through our pages, or read our blog for extra tips and guidance. If you have one minute, please do help our research and let us know what problems you have reading on screen. Find out how to make notes digitally on your PDFs, Word docs, web pages and ebooks. Tips and tricks for specific devices to make reading on screen easier. 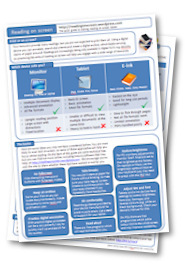 Using ‘full screen’ views for PDFs and websites and software designed to help you focus on reading text. Resizing text on webpages and in PDFs. Get documents read out loud to you by your device. Free yourself from pen and paper utilising software for different forms of note-taking.